Synopsis: (Taken from back of book) Amelia Geist, Holly Schenck, and Tris Holloway are all broken — in one way or another. In a lifelong act of penitence and defiance, Amelia Geist has remained a virgin and saved herself for Tris, her first love, who abandoned her more than fifty years ago. A few weeks from retirement, Tris Holloway has led a separate life of his own in the hills above Silicon Valley, sealed by inertia within the confines of a loveless marriage and shattered by his decision to leave Amelia. The only person who can repair the rift between Tris and Amelia is Holly, a single mother without means, who is trying somehow to mend her life while laid out in a hospital bed, a victim of her own suicide attempt. The stories of Tris, Holly, and Amelia are presented in Fragile as broken fragments, woven together by profound truth and an astonishing connection that transcends the boundaries between this world and the next. A big no-no was committed while writing this book, forgetting your POV. One minute the book is being written in third person and not entirely bad at all. We are introduced to a woman named Holly who does hair. It goes on to describe how an older woman comes in wanting something special done for a reunion party she is going to. She wants to look fabulous. Then without notice the book switches to first person (in the view of the old woman) and then switches back to third person. I got to read about 10 pages and I couldn’t do it. Is the book written in first person or third? I felt as if I was in the mind of a person with multiple personalities because the book had no idea which point of view it was taking. I had no idea who I was as a reader, or what I was reading about. It got to be too confusing that I had no other option than to put it down. I think the author needs to decide — is the story first or third before I can continue. I even skimmed the book and it was all through out the novel. One minute first and the next third. This just cannot be done. No way. No how. Fragile by Chris Katsaropoulos needs a major overhaul. I also wonder if I read the same book as the reviews on Amazon. Painted in such a fabulous light — did not one person realize that the author broke a cardinal rule of writing, faulty point of view? I wouldn’t mind reading Fragile in the future, but only after the author decides the point of view of the characters in the story. 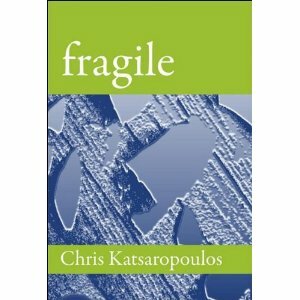 Fragile is the debut novel of Chris Katsaropoulos, a keen observer of human nature whose prose is innovative, poetic, and at times truly transcendent. While juggling three different perspectives, he keeps us very much in the moment and yet the past is always present (and deeply felt) for his characters.